Hello, we’ve been working to update the telescope a bit, Sunayana has been writing some image processing software to make the analysis of spectra faster for undergraduates and we have been cleaning up the dome, more on that in a future post. First Saturn. It’s very low in the sky from up here in the UK and in London that’s bad, that’s very bad. We have the Chelsea Lamborghini exhaust haze to the South East where Saturn pops up. And there is huge thermal turbulence from the heat of the city which makes the density of air vary along the path of the photons, changing its refractive index and turning the air into a constantly distorting irregular lens which makes images wobble. 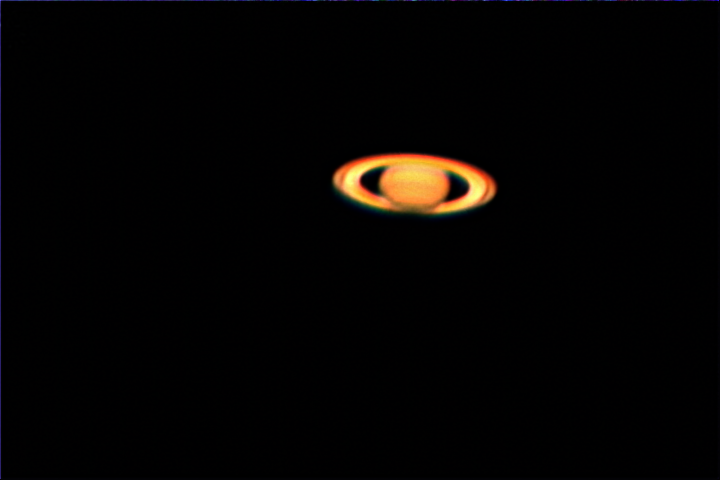 Saturn from London, see text for excuses as to why this is a difficult planet for us. Next we looked at M27 Dumbell nebula which is a planetary nebula – what you are looking at is the expanding shell of gas from the Star which used to live at the middle, its the outer parts of that star that you can see, the inner parts would have formed a white dwarf star which is sitting somewhere in the middle. That star will be so dense that a spoonful will literally weigh a ton but its very small so while it will be very hot, it won’t be very bright and it won’t do much, it will just sit there and cool down. Slowly. It’s not very bright, I need to take more exposures and then stack. 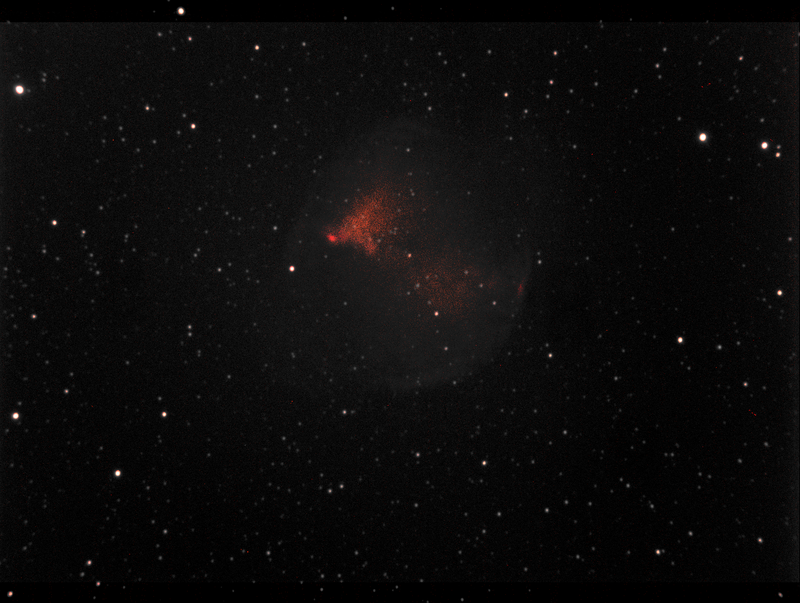 I did it through a hydrogen alpha filter as well because nebulae emit loads of hydrogen alpha photons. I’ve coloured that bit in red. We will definitely revisit this object and try to do a better job. Finally I’m going to show you a globular cluster. Now these objects look a bit boring but they are super important for Cosmology. 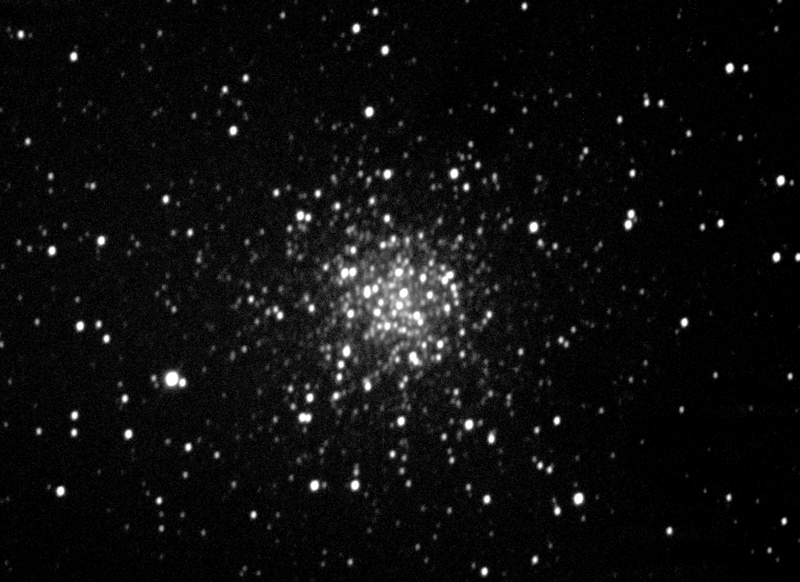 Globular clusters are spherical balls of stars, usually about a quarter of a million stars, There are two kinds of globular clusters, old ones and new ones. New ones form recently in galaxies, old ones formed a long time before any galaxies existed, in fact people thing they are at least one component of the building blocks for galaxies. They are the oldest remaining objects in the Universe today and by looking at the stars in them we can tell how old they are. Now I’m not going to go into this in massive detail today because I don’t have time, but if you look at how quickly the Universe is expanding today and make some reasonable assumptions about what it contains you might calculate that it was only around 9 billion years old. However, some of the old globular clusters are more than 12 billion years old, so this shows you that your assumptions are probably wrong and indeed is one of the reasons why we think dark energy exists, to make the Universe older. Anyway here is a picture from the roof of one of the very old ones. M56. In other news, I have been interviewed for the Sky at Night television program, which is very nice for me. I used to watch this program when I was young and trying to see things with my very bad argos 60mm refractor telescope. I thought when I turned my back on becoming a pure astrophysicist in 1997 that my chances of getting on the program were gone but here we are, life is strange! I’ll be talking about dark matter at 2210 on Sunday 9th August on BBC four. I was interviewed by Chris Lintott and not Maggie Aderin-Pocock although I did say hi to her. The whole team were very nice and Chris was very friendly, he’s very good with people – I suppose that’s his job but he does it very well.